Over the last few weeks I got some interesting calls from a few people I know. All these people had only dabbled in the equity markets and did not make any serious investments before 2018. They all had a feeling of missing out on the action in the beginning of 2018, as 2017 was a year where equity investors had fairly good returns. All these people were enticed into the market and made investments in Jan to Mar 2018 period and all the portfolios were down by 25% or more. A couple of these investors invested only a small portion of their total assets and can withstand the loss without too much sweat. Others had committed larger sums, in the sense that these losses hurt them a bit more. Taking large bets at a single point in time is okay, if the capital being committed is speculative capital, i.e., one is ok with a significant loss of capital at stake for a chance to make outsized return. But this approach may not be best suited for people looking to build wealth. One of the assumptions based on which people hand over their funds to a professional is that that person “knows” better. Investors rarely stop to think what is that the professional “knows”? Most investors have a tacit assumption that the professional knows what will happen in the market and the professionals rarely try to dissuade people of their assumption. A professional can bring in discipline and research to the investment approach and these could be valid reasons to choose a professional. But the “tacit” assumption that the person knows “what will happen in the market” is NOT the reason to choose a professional. If someone was smart enough to know what will happen in the market for just one hour, then that person would be smart enough to earn enough money in that one hour to never have to work again. In these days of increasing specialization most people don’t have the time or inclination to manage their money. And it is okay to have a professional to do it, but a few things that one should remember and look for. There are NO guaranteed get rich quick schemes (many of these could be guaranteed lose money quick schemes). Invest slowly over a period, there are always opportunities in the market, if someone has a decent approach, they will do well over a period. Make sure that the professional is making money with you and not off you. (The fee structure should be such that the professional gets paid for delivering desired results). Note: These pointers are relevant when one is looking to build wealth through investments and may not be relevant for deploying speculative capital. Here is some data over the last 5 years that could help understand the odds in equities markets. We divided the companies based on the average market capitalization (size of the company) for the year. “A” being the average. For instance, A-3A has all the companies that have market capitalization between A to 3 times A. A couple of observations from the above charts…. Equity markets are a good place to invest as the odds of doing well are above 50% in most years. Mediums size companies tend to have better odds of beating Index in most periods. 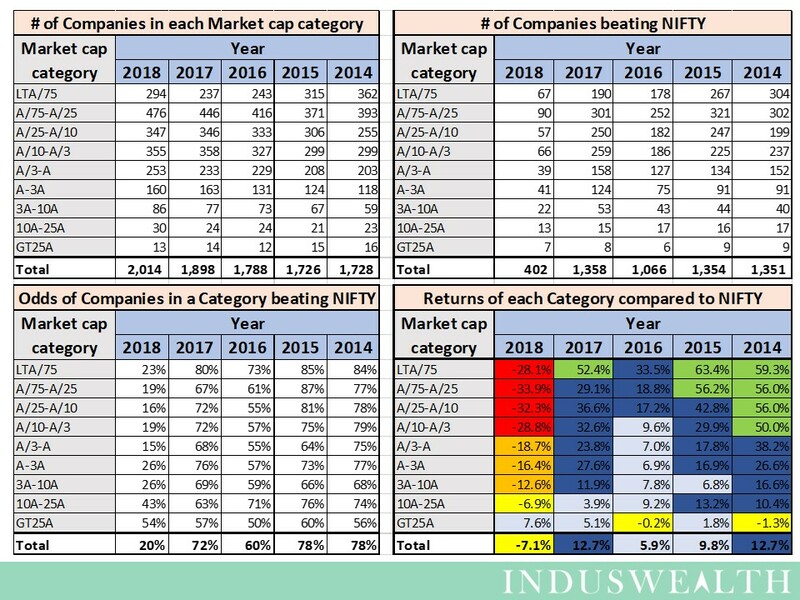 2018 has been an exceptionally bad year with less than 20% of the companies beating the Index. In 2018 only GT25A category has managed to beat Index. Most portfolios may not be doing well in 2018. To complete the story, I started this article with….. Most of the calls I received were to get some “reassurance” that things will be alright. I informed them that their losses were more of less in-line with the market. I also mentioned that a 25% drop in the overall capital would be tough to recover in a short period of time. I was left with a distinct impression that the sales pitch they received glossed over the risks of making a relatively large investment over a short period and they went ahead with their investment based on the assumption “someone knows”. Sir. Fantastic article. And I believe that “someone knows” is you. Whether it is project, profession or investment there are no shortcuts.